The Aylesbury, like the Orpington, is named after the place of its creation, the Vale of Aylesbury, England. 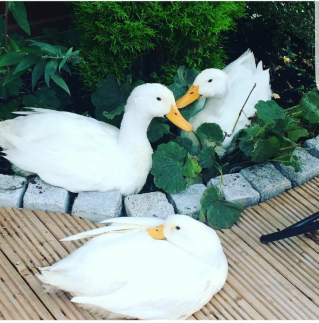 The birds where originally called the White English, but by the early 1800s the Aylesbury duck was so famous that the birds became known as the Aylesbury. 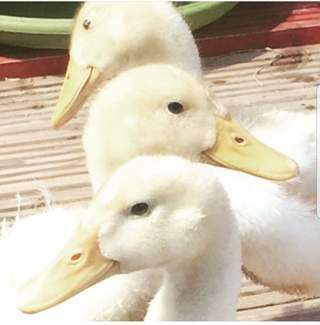 Their breeding success was believed to come from a handy supply of white gravel found in the local streams which gave the birds their pale pink bills. 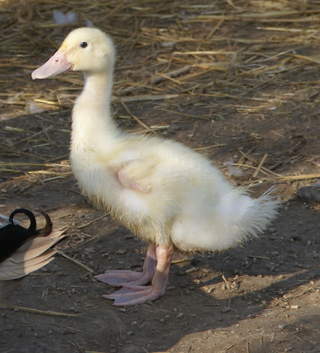 The birds were bred in the \'Duck End\' of town often in people\'s cottages. 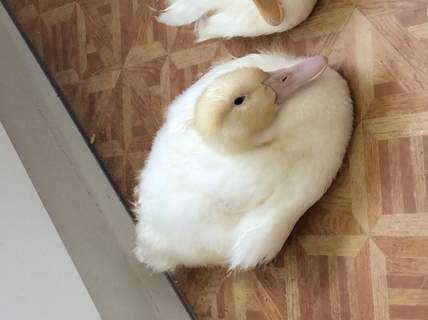 Some would even take their ducks to bed to guarantee that they were warm. 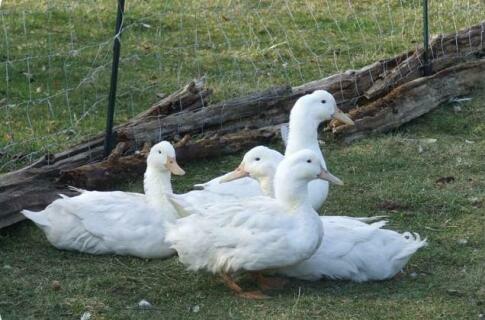 When going to market the ducks were often walked from Aylesbury to London, a distance of some 40 miles. This took several days and their feet would be protected by a covering of tar and sawdust, which was re-applied every morning. 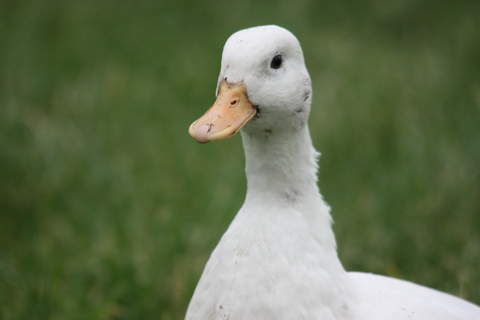 By the 1850s Aylesbury town\'s market dominance declined as the town become industrialised and new sanitary regulations made duck rearing in cottages difficult. The Aylesbury has always been regarded as a great table bird as it grows and matures very quickly and has a flavour and quality that is hard to match. 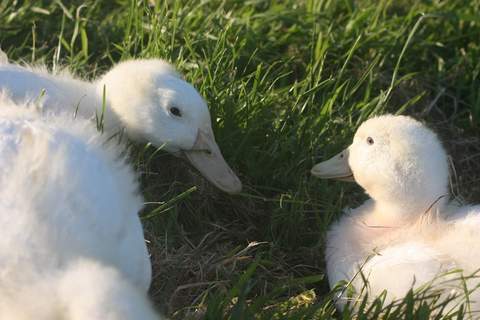 Aylesburys are good natured and friendly, although they do have quite a loud quack. Aylesburys are only available in pure white. 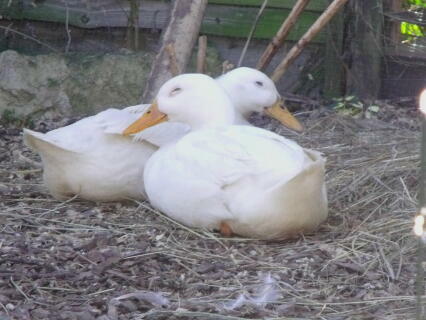 We have 2 Charlie(Drake) and Dolly.Both just over 1year old.Dollies been laying for 4 months ,ignoring the early eggs which I took away and incubated.12 of them hatched.Laterly she built a nest 5 weeks ago and out of 14 eggs we have 3 lovely ducklings.At the moment we are keeping Charlie away as I've been warned he could harm any males due to jealousy. I've had several Aylesbury's over the years, they are very friendly and sociable, mine would come and sit on me in the garden. You can see more of their personalities if you only have a few. I found that mine would only lay eggs once a year, perhaps as they were free range and weren't shut away at night. 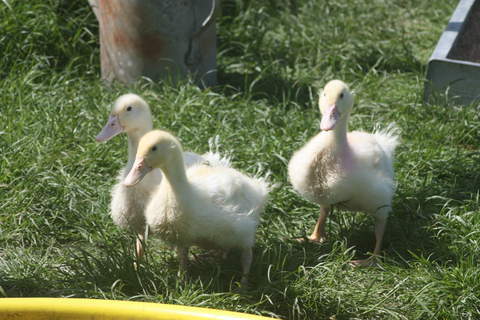 Aylesbury ducks are a good starter breed and girls lay usually 3 eggs a day as to how many ducks you have. males are very protective around females.